Barcelona, 22nd March 2018 – FADA CATEC is supporting Zero 2 Infinity (Z2I) in the development of a new generation of rocket engines. This March, FADA CATEC has successfully 3D printed a combustion chamber for Zero 2 Infinity’s Bloostar engine. 3D printing the engine entails a dramatic reduction in cost, environmental impact, production time, and mass. Z2I is thrilled to have the support of FADA-CATEC technologies’ and its professionals and is looking forward to working closely with them. The plans of the companies include using artificial intelligence (AI) and neural networks to optimize the cooling of the thrust chamber via structures that cannot be manufactured by any other means. Bloostar’s engine was named Teide after the Spanish highest mountain, a—no longer active—fire-erupting volcano. Teide is located in Tenerife, in the Canary Islands, where Bloostar is going to be launched from. Bloostar first stage is a balloon that brings the rocket above 99% of the mass of the atmosphere, where the aerodynamic resistance is almost non-existent. This method yields significant advantages compared to ground or aircraft-based launchers. A clear advantage is that the engines work more efficiently in near vacuum. Thus, Teide has a unique design to be specifically launched from a high altitude and is the most eco-friendly engine designed up to date. Zero 2 Infinity is a Barcelona-based privately-owned company with subsidiaries in Germany and the United States that is radically simplifying access to Space. The company is specialized as the single private actor in Europe in Near Space transportation of components requiring testing and certification in Space conditions. Z2I is also working on placing small satellites into orbit with the Bloostar launcher project and has medium-term plans to send people to Near Space for scientific activities and tourism with its pod, Bloon. FADA is a non-profit organization created in 2008 to promote and develop technological knowledge and its transfer to the aerospace industry. CATEC, the Advanced Center for Aerospace Technology, is located in Seville and is managed by FADA and focused on applied research, development, and technological innovation for aeronautics and space. 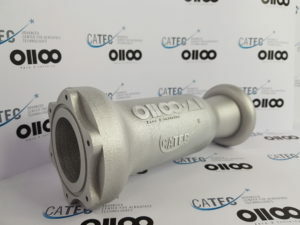 CATEC is the European leader in the development of additive manufacturing application for Space and aeronautics, including hardware for critical and secondary structures, among others.